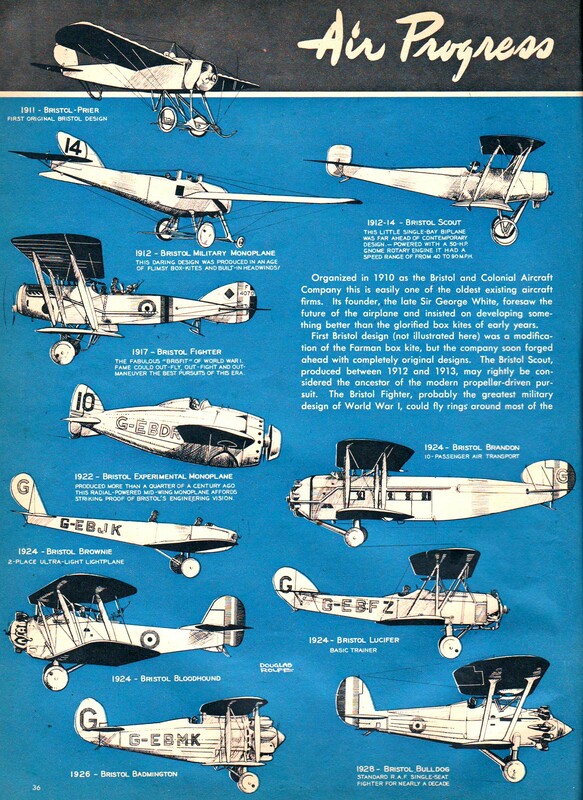 The Bristol Aircraft company was one of Britain's first commercial and military airplane manufacturing firms. 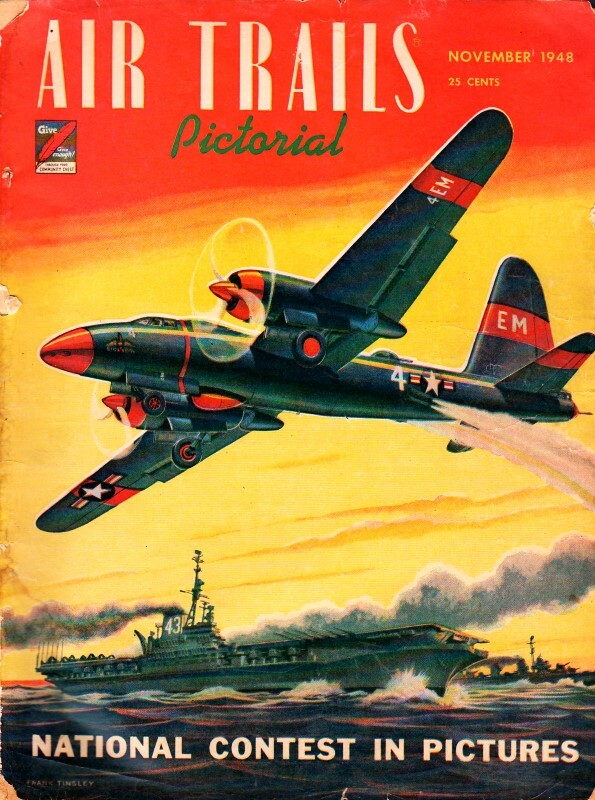 Less than a decade after the Wright Brothers made their successful flight, the entire civilized world was scurrying to develop airplanes and vie for the lead position. World War I broke out in Europe 1914, which created a huge demand for aerial fighting platforms. Sir George White's company was willing and able to do so. 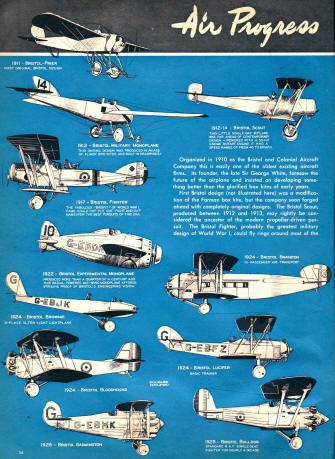 Many famous designs came from his factory, including the Bristol Scout and Bristol Bulldog. Scarcely a major scale model contest is held where you do not find at least one of Bristol's designs. 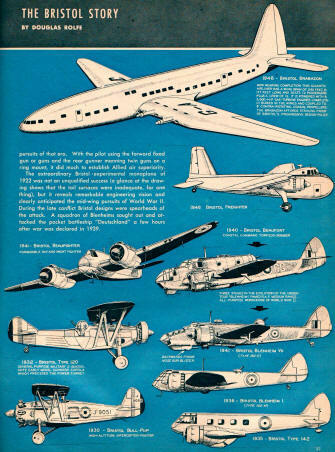 This two-page spread from a 1948 edition of Air Trails gives some history on 20 Bristol aircraft. 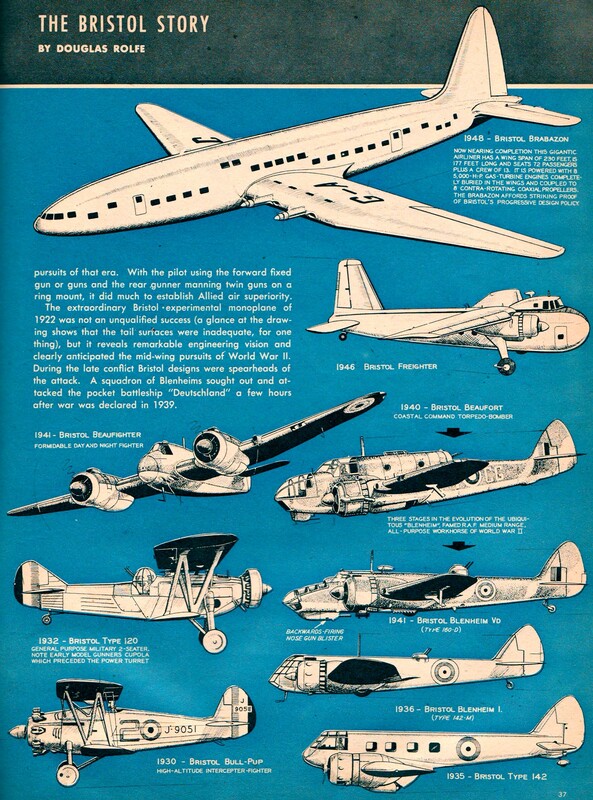 Organized in 1910 as the Bristol and Colonial Aircraft Company this is easily one of the oldest existing aircraft firms. Its founder, the late Sir George White, foresaw the future of the airplane and insisted on developing something better than the glorified box kites of early years. First Bristol design (not illustrated here) was a modification of the Farman box kite, but the company soon forged ahead with completely original designs. The Bristol Scout, produced between 1912 and 1913, may rightly be considered the ancestor of the modern propeller-driven pursuit. The Bristol Fighter, probably the greatest military design of World War I, could fly rings around most of the pursuits of that era. With the pilot using the forward fixed gun or guns and the rear gunner manning twin guns on a ring mount, it did much to establish Allied air superiority. The extraordinary Bristol experimental monoplane of 1922 was not an unqualified success (a glance at the drawing shows that the tail surfaces were inadequate, for one thing), but it reveals remarkable engineering vision and clearly anticipated the mid-wing pursuits of World War II. During the late conflict Bristol designs were spearheads of the attack. A squadron of Blenheims sought out and attacked the pocket battleship "Deutschland" a few hours after war was declared in 1939. This daring design was produced in an age of flimsy box-kites and built-in headwinds! This little single-bay biplane was far ahead of contemporary design - powered with a 50-H.P. Gnome Rotary Engine it had a speed range of from 40 to 90 M.P.H. This fabulous "Brisfit" of World War I fame could out-fly, out-fight and out-maneuver the best pursuits of this era. Produced more than a quarter of a century ago this radial-powered mid-wing monoplane affords striking proof of Bristol's engineering vision. Now nearing completion this gigantic airliner has a wing span of 230 feet, is 177 feet long and seats 72 passengers plus a crew of 13. It is powered with 8 5,000-H.-P. gas-turbine engines completely buried in the wings and coupled to 8 contra-rotating coaxial propellers. The Brabazon affords striking proof of Bristol's progressive design policy. 1936 - Bristol Blenheim I.